United Poultry Concerns is running this ad in 10 special editions of the University of Maryland student newspaper The Diamondback. From March 3 through May 12, “Please Help Me - I am Suffering” targets an audience of 9,000 readers each time it appears. The total cost of our Spring semester sequence of 10 ads is $10,265. We gratefully accept donations for this ad campaign aimed at University of Maryland students, faculty & all campus affiliates. The University of Maryland receives a lot of funding from Perdue Farms. It’s important that the truth be told about the horrible suffering and cruelty of “Perdue” chickens. 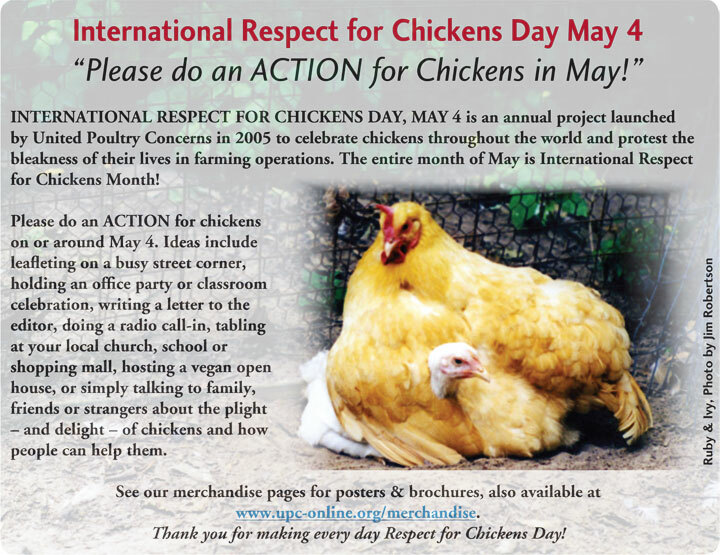 International Respect for Chickens Day is just a few weeks away! Ivy, the white chick in this photo being sheltered by her adopted mother Ruby, was saved from Perdue. Please stick up for chickens & let every savior be YOU! In the slaughter plants, chickens, turkeys and ducks are subjected to electric shock water through which their faces are dragged, head down. The purpose is to paralyze the muscles of their feather follicles after they are dead. They are NOT stunned, i.e., rendered unconscious or pain-free. This procedure precedes their necks being partially cut by huge automatic blades after which they are moved to a bleed-out tunnel while alive and conscious, where they hang for 90 seconds before being plunged into scald water tanks, dead and alive. The millions of chickens each year who are still alive when they enter the scald tank struggle so violently that their eyes come out of the sockets and their bones break. They are put through all this agony after having been forced to live in filth and darkness on crippled joints in bodies wracked with pain and diseases. I live on the Eastern Shore of Virginia and see day after day the baby chickens being trucked up and down the roads to slaughter. All they have ever known of being alive in the flesh is human cruelty, illness, pain, and filth in all its forms. Former Tyson chicken slaughter employee Virgil Butler wrote of his observations of the chickens he witnessed every day: "Every chicken is bled out while still sentient. They hang there and look at you while they are bleeding. You can definitely tell they know what is going on. Sometimes if they are not completely immobilized by the paralytic 'stunner' (which happens frequently), they will try to hide their head from you by sticking it under the wing of the chicken next to them." Virgil Butler became a vegetarian when finally, speaking of himself and his partner Laura, "We just couldn't look at a piece of meat anymore without seeing the sad, tortured face that was attached to it some time in the past." There is a wealth of nourishing and delicious foods for us to choose that are animal-free. These foods include protein-rich chicken-like products that replace any need for us to bring chickens or any other animals into the world merely to suffer and die for our appetites. We need to put slaughterhouses behind us and welcome the culinary opportunities that beckon. Fortunately, more and more people are discovering these culinary opportunities and taking advantage of them. The Comments section is now closed but you can submit a 150-word letter to the editor of The New York Times (we did!) at www.nytimes.com.